Heat your oven to 425 degrees. Combine the panko, lemon zest, olive oil, and a pinch of kosher salt in a small bowl. You want the panko to be moist. Gently stir in the dijon mustard. Dry the salmon. Divide the mustard/panko mixture among the filets and press it into the flesh. Heat the vegetable oil in a large, oven safe frying pan over medium high heat. Add the salmon to the pan, skin side down, and cook, without turning for 3 to 4 minutes. Transfer the frying pan to the oven and cook for 10 to 15 minutes until the salmon is nearly cooked through. Carefully remove the frying pan from the oven and serve. The following post originally appeared on BAH on 31 August 2009. I’ve been making an effort to go through my old recipes, the ones that I’ve already tried out and decided are keepers, and post them. My goal is to turn my home files into a printed record of what you see here at BAH. Today’s tidbit is from the pages of Cooking Light. 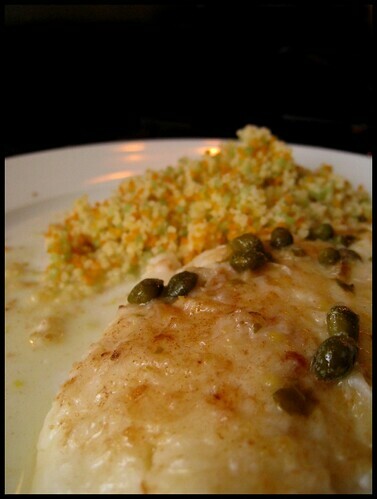 BAH Note: I didn’t have Tilapia on hand that last time I made this so I used Orange Roughy. Any firm, white fish would probably work. Just make sure that it’s a thin fillet. I find that the pan sauce is a little piquant even with rinsing the capers, which I used instead of brined peppercorns. When you add the butter into the pan sauce, remember that even softened solids going into liquids will cause a splash. I didn’t, and ended up with sauce everywhere. Combine broth, lemon juice, and peppercorns (or capers) in a small bowl. Melt 1 teaspoon butter with vegetable oil in a large nonstick skillet over low heat. While butter melts, sprinkle fish with salt and pepper. Place the flour in a shallow dish. Dredge fillets in flour and shake off excess. Increase heat to medium-high until butter begins to turn golden brown. Add fillets to pan and cook for 3 minutes on each side or until fish flakes easily when tested with a fork. Remove fish from the pan and cover to keep warm. Add broth mixture to pan, scraping up any loosen browned bits. Bring to a boil cook about 3 minutes or until reduced to 1/2 cup. Remove from heat and stir in last 2 teaspoons butter with a whisk. Spoon sauce over fillets and garnish with lemon wedges, if desired. Combine the diced tomato, orange zest, capers, sugar, vinegar, and olive oil in a small bowl. Season to taste with kosher salt and black pepper and set aside. 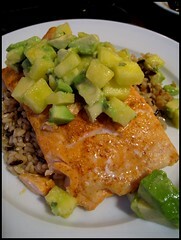 Dry the salmon and heat the vegetable oil in an oven safe frying pan over medium high heat. Add the salmon, skin side down, and cook for 3 to 4 minutes, without turning, before transferring the frying pan to the oven. Cook for 10 to 12 minutes or until the salmon is almost cooked through and flakes easily with a fork. Carefully remove the pan from oven and serve the salmon topped with the tomato caper relish. BAH Note: When I make this, I keep a second can of coconut milk on hand in case I’ve put too much curry or chili paste in the sauce. Additional coconut milk will cut the heat a bit. The fish sauce and sugar should balance each other out so your sauce is neither too sweet nor too salty. I usually end up adding the juice and zest of a second lime to brighten the flavors and pull everything together. Taste your sauce after you’ve added one lime’s worth of juice. If it tastes kind of flat, add more juice and zest. Heat your oven to 350 degrees. While the oven heats, melt the coconut oil in a large, oven safe frying pan over medium heat. Whisk in the curry paste and chili paste and cook for a minute or two until you start to smell the curry. Then whisk in the coconut milk, fish sauce, sugar, and lime juice and zest. Taste for seasoning and adjust until it tastes the way you like it. Bring to a boil, remove from the heat, and add the tilapia filets. Transfer the pan to the oven and cook for 20 minutes or until the fish flakes easily. Using a spatula or serving spoon, carefully break up the fish in the curry sauce. Serve as is or over rice. The following post was originally published on BAH on 28 August 2009. A good amount of the disk space on our Tivo gets taken up with cooking shows. Food Network, PBS, I like to mix it all up. When I watch them, I frequently experience kitchen envy. Seriously, have you seen Paula Deen’s or Ina Garten’s kitchen? Dreamy. Multiple cooktops, deep fryers, and refrigerator drawers. Best of all are those professional stoves. 48 to 60 inches of high btu muscle with double ovens. They are the kitchen equivalent of the Ford Mustang in Steve McQueen’s Bullitt. High revving, rubber burning, wild horses. I so wish I could have one of those. My kitchen, in comparison, is more like a Honda Accord. It’s reliable for getting you where you need to go but would never win in a drag race. Not that having fancy, expensive equipment means anything when it comes to serving up good food. Deb, who I heart, from Smitten Kitchen turns out the best food from a teeny, tiny New York City apartment kitchen. Think your kitchen is small? Try working in a 24 square foot space. That’s smaller than my closet. And yet, without the aid of fancy equipment, she turns out all sorts of baked, fried, and roasted goodness. Like anything else, your equipment is a tool that either you know how to use or you don’t. That 48 inch Viking isn’t going to magically transform a bad dish into a good one. So work with what you have, find its muscle, and make it work for you. Your kitchen may not burn rubber like Steve McQueen’s Mustang, but it won’t need new tires as quickly either. I added paprika and chili powder, not original to the CI recipe. Place a sheet pan on an oven rack in the lowest position and heat oven to 500 degrees. If your salmon has skin, make 4 or 5 shallow slashes about an inch apart along the skin side of each piece. Do not cut into the flesh. Dry salmon with a paper towel, rub with oil and season with salt, paprika, and chili powder. Reduce oven temperature to 275 degrees and remove the HOT baking sheet. Carefully place salmon (skin side down) on your sheet pan. Roast until salmon is still translucent in the thickest part of fillets when cut into with paring knife or when an instant read thermometer inserted in thickest part of the fillets registers 125 degrees, 9 to 13 minutes. Transfer fillets to individual plates or platter. Combine the pineapple, avocado, scallion, salt, and lime juice in a mixing bowl. Toss to combine. The following originally appeared on 3/25/09 at Exit 51. Each week, SFC picks one meal that he will cook. As hard as it is for me not to jump in and take over on these nights, I really do like the days when I’m just the sous chef. I’m much happier sitting on the couch turning the pages of a book than standing over a stove whisking or reducing. We did have to establish one major rule though. The first time we make a recipe, we do not deviate from it as written. No substitutions, no omission, no tinkering with technique. Ok, so maybe we do allow minor substitution and omissions. But we do not deviate from technique. It may sound a bit harsh but how can someone new to cooking know what steps are critical and what steps are negotiable? I’ve been standing at the stove for years and I still try and stick to this rule anytime I try a new recipe. And here’s why. If I don’t try and create a dish as specified by the author, how can I form an accurate opinion about whether it’s worth making again? If I don’t like the results, is it because of the recipe itself or is it because in tinkering with it, I broke something that did not need fixing? SFC’s most recent meal is my latest case study. In theory, it should have been outstanding. But after dinner, we both looked at each other and said it was missing something. I’m not sure what this elusive something is. Maybe more spice? Maybe more heat? But it definitely needs the volume turned up. And I don’t understand what the marinade really does for the dish, besides give you the 20 minutes to make the salsa. Maybe next time we will make more spice rub and skip the marinading. For now, this recipe is tagged with a question mark and goes back into the test folder. It’s got one more chance to impress me because in my kitchen, a recipe rarely gets a third try. Combine the oil and vinegar in a shallow dish. Combine the chili powder, salt and sugar in a small bowl. Use it to rub the salmon fillets all over, gently pressing it into the flesh, then place the fillets in the oil-vinegar mixture. Turn them over so both sides are coated; let them marinate at room temperature for 20 minutes while you prepare the salsa. Combine the pineapple, avocado, scallion, pepper, salt and the tablespoon of lime juice in a mixing bowl; toss to mix well. When the pan is hot, add the fillets (if skin-on, place them skin side up) and cook for 1 minute. Turn them over, then transfer the skillet to the oven. Roast for 8 to 10 minutes per inch of thickness or to desired degree of doneness. Remove from the oven; use a wide spatula to transfer each piece to individual plates. Spoon the salsa on top of each fillet. Cut the remaining lime in half and squeeze over each portion. Serve immediately. The following originally appeared on 3/11/09 at Exit 51. As I’ve mentioned, I used to subscribe to Cooking Light. But the sheer volume of recipes they fit into a single magazine overwhelmed me. Instead of tackling the challenge head on, I ignored it and hoped it would go away. But it didn’t. That is why, years later, I’m still pulling pages torn from CL out of my test recipe folder. I only wish they printed the date or the issue on the pages so I could know exactly how long these things have been waiting to see the light of day. Because to be honest, some of these deserve not only the light of day, but a spot light. Like the Tilapia in Mustard Cream Sauce. This was a recipe sent in by a reader. Kudos to Alix McLearen of Wesley Chapel, Florida because I think your recipe may have just nudged the Barefoot Contessa’s Mustard Roasted Fish out of my binder. As much as I like Ina’s Mustard Fish, I like this one even better. The sauce has a more balanced flavor without relying so heavily on the dairy portion of the food pyramid. And the addition of the mushrooms brings a bit of earthiness to the dish. It’s funny that I ended up pairing this fish with the same side as I used with Ina’s. 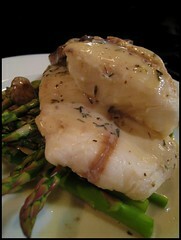 Either fish and asparagus really do go together or I’m incredibly predictable. Either way, I think you should definitely put this recipe on your to-do list. And we can discuss my predictability over a plate of Tilapia in Mustard Cream Sauce. According to the author’s notes, orange roughy or chicken can be substituted for the tilapia, and tomatoes or spinach can be subbed for the mushrooms. I wanted a slightly thicker sauce so I let the chicken broth reduce a bit after the fish was removed, as well as kept the sauce on the heat longer after the mustard and cream were added. I recommend adding the fish back to the pan for a few moments before serving. Sprinkle fish with thyme, pepper, and salt. Heat a large nonstick skillet over medium-high heat. Add fish; cook 1 minute on each side. Add broth and bring to a boil. Cover, reduce heat, and simmer 5 minutes. Add mushrooms and cook, uncovered, 1 minute until mushrooms are tender. Remove fish from pan; keep warm. Add cream and mustard to pan. Stir with a whisk until combined. Cook 1 minute or until thoroughly heated. Serve sauce over fish.